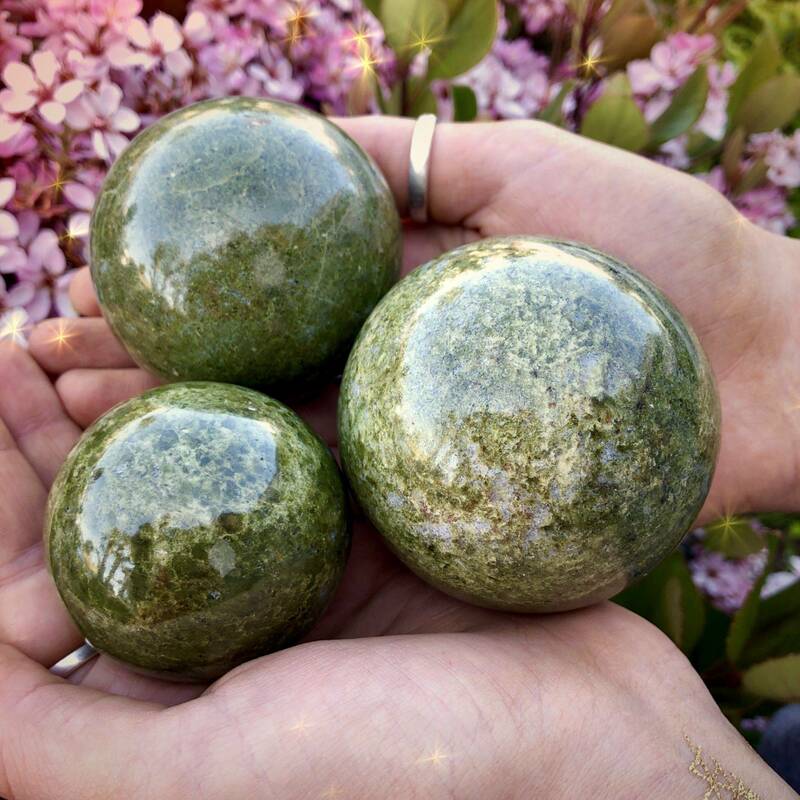 Increase, increase, increase – that’s the magic and medicine of these Manifestation Epidote Spheres. Epidote is a protective and grounding stone that’s an equally powerful manifestation gem. It works to help you manifest your desires and also works to clear whatever stands in the way of you creating the life you desire. 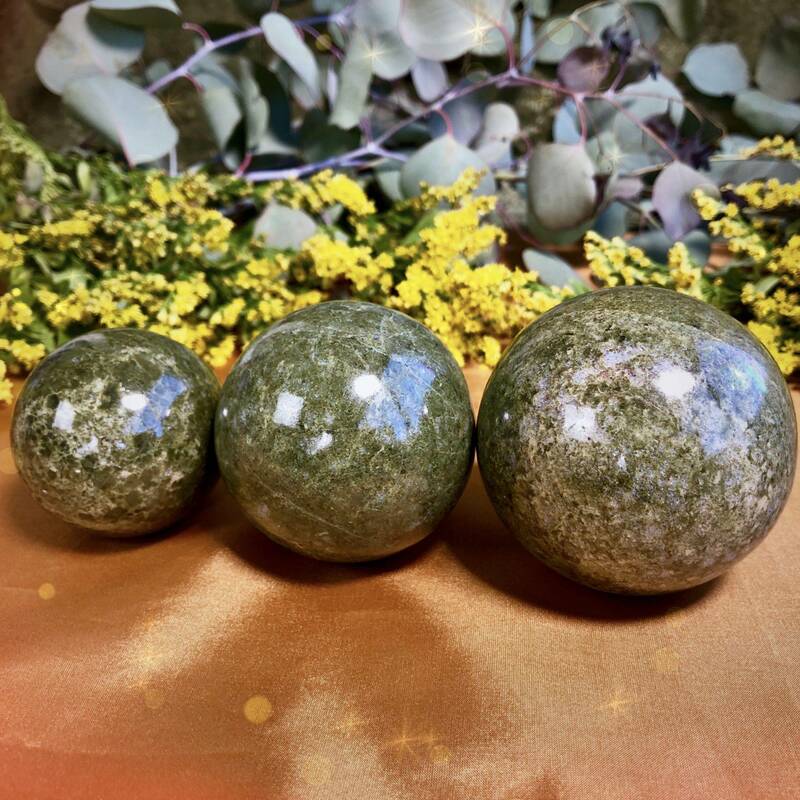 These Manifestation Epidote Spheres are true talismans of prosperity and abundance; work with them to experience greater fullness and fulfillment! Epidote brings potent and pure manifestation power. Epidote’s name comes from the Greek word for “increase,” and it’s known as a primary attraction stone because it brings more of what you create and what you desire. If your mindset is focused on manifestation, epidote removes obstacles and boundaries to success and wealth. With epidote, you will feel lighter and freer, as it dissolves your physical and energetic blockages. This stone is also protective and grounding. Spheres are important magical tools. They generate, receive, and send energy in all directions. Above, below, and toward all four sacred navigational points. 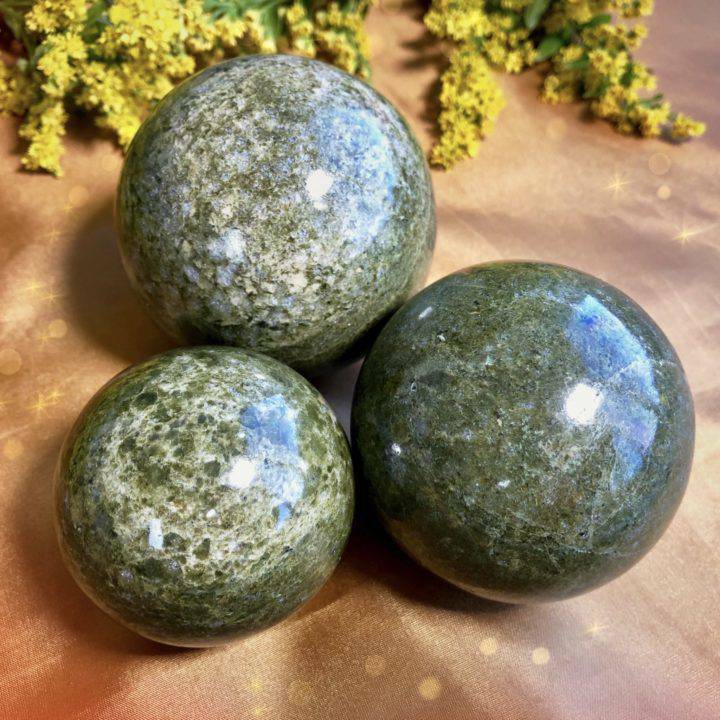 Work with these Manifestation Epidote Spheres during meditation. Imagine the life you desire to live and focus on what it feels like to have it already manifested. Carry that feeling with you as you work with these spheres. Don’t forget a sphere stand to display your new treasure when not in use. This listing is for one (1) Manifestation Epidote Sphere. I have three sizes to offer you: Small (about 1.5-2”), Medium (about 2-2.5”), and Large (about 2.5-3”). Please choose the size that calls to you from the drop-down menu. Yours will arrive lovingly parceled along with a single leaf of white sage and a card describing the properties of the stone.